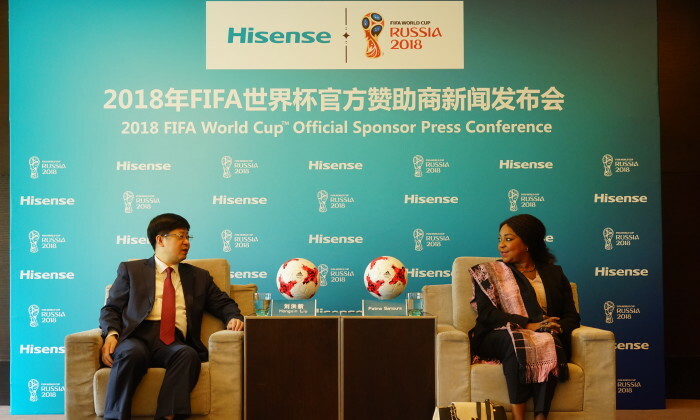 In a joint press conference held with FIFA in Beijing, Hisense announced its status as an official sponsor of the 2018 FIFA World Cup, becoming the first Chinese consumer electronics brand to sponsor the tournament and the second Chinese company to join hands with FIFA after Wanda. As an Official FIFA World Cup sponsor, Hisense will engage in an array of global marketing and advertising activities for both the 2017 Confederations Cup and 2018 FIFA World Cup, reaching more than 200 territories in the process and greatly enhancing international exposure for the brand. The electronics manufacturer will be able to associate its logo with the forthcoming FIFA events mentioned above, as well as numerous other rights that include access to advertising boards in stadiums, on-screen credits and other various creative marketing opportunities on-and-off the pitch during the events. Hongxin Liu, president of Hisense Group, said sponsoring the prestigious tournament serves as a crucial, strategic initiative for the entire enterprise. “We are honored to take on our biggest challenge yet with the FIFA 2018 World Cup, and believe it will vastly improve global awareness and economic value for Hisense as a truly international brand. The World Cup brings together the highest level of competition and prestige in football worldwide, making it the perfect platform for us to be a part of,” said Liu. A large part of Hisense’s international strategy has been to actively engage in sports marketing to raise brand awareness. Over the years, the electronics manufacturer has sponsored major sporting events and team sponsorships like UEFA’s Euro 2016, Nascar’s XFINITY series, Joe Gibbs Racing, the Australian Open, and Germany’s FC Schalke 04. These activities, coupled with its innovative high-value products, have helped the brand maintain its status as the NO.3 television manufacturer worldwide into 2017. The 2017 FIFA Confederations Cup will be held in Russia, from 17 June to 2 July 2017, while the 2018 FIFA World Cup will take place from 14 June to 15 July 2018 in 11 host cities across Russia with a total of 64 games.